When the Geekvape Aegis 100w TC Box Mod launched, it quickly became popular and one of the main reasons as to why is, because of it’s incredibly durability. It was tested by many reviewers, and it’s a fact that this vape mod can withstand a beating, making it a great device for vapers looking for something they can use on a daily basis without worrying about any issues when dropped on the floor or even in water. 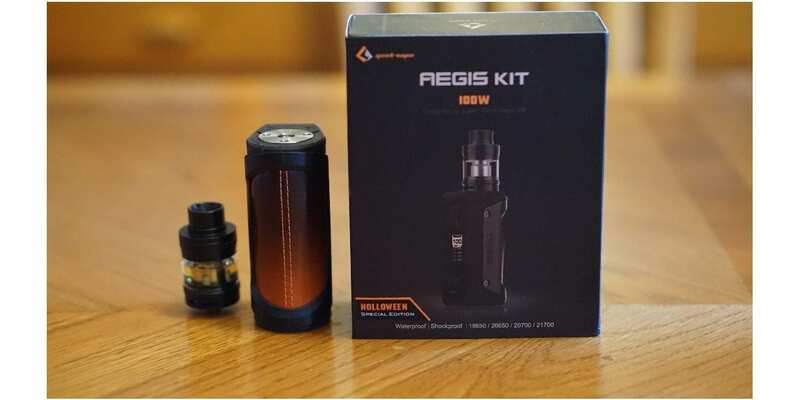 Now Geekvape is back with the Aegis Kit which includes the new Shield Sub Ohm Tank, and this specific one is the Halloween Special Edition, sporting an exclusive burnt orange leather back. Before getting any further, we’d like to thank MyVpro for sending this vape starter kit our way for the purposes of this review. We’ll go over our first impressions, usage, performance, pros and cons, and conclude with whether or not we recommend the Geekvape Aegis Kit! Click Here to Check Out the Geekvape Aegis Kit Halloween Special Edition! If you’ve read our previous reviews, you know that we’ve been quite impressed with the packaging Geekvape offers on their products, and the same can be said for the new Aegis Kit. The Geekvape Aegis Kit does come in a fairly large box, and it clearly states right in the front that this is the Halloween Special Edition, which is a nice touch. Also, on the front of the packaging you have an image of the vape kit itself alongside the name and minor information of what type of batteries this mod can house and the main durability features. On the back, you can find some more information of what’s included in this kit. As soon as you slide open the packaging, you’re met with the Geekvape Aegis 100w TC Box Mod, the new Shield Sub Ohm Tank, a replacement glass tank section, and a box filled with accessories. Underneath it all is where you can find the user manual just in case you needed it. The accessories included in this kit are an additional 0.15 ohm replacement coil head, 20700/21700 battery cap, an 18650 battery adapter, a silicone seal replacement, 2 spare torx screws and a bunch of spare o-rings for both the mod and vape tank. I was certainly impressed by what Geekvape gives you in the packaging, especially the 18650 battery adapter and the 20700/21700 battery cap. This really adds to the overall value of this vape starter kit, and gives you flexibility in regards to which type of battery you can use. Since they give you all of these accessories, the Geekvape Aegis included in this kit is compatible with 26650, 18650, 20700, and 21700 batteries! So that’s four different battery options you have with this device, which is definitely a huge pro in my book! We did cover our initial thoughts about our first impressions of the Geekvape Aegis in our original review, so we’ll focus mainly on the Shield Sub Ohm Tank for now. My first impressions of this tank is that it is quite large, and definitely bigger than some of the other sub ohm tanks on the market today. However, this certainly fits the Aegis quite well since this device can easily house atomizers up to 30mm. The capacity of this tank is 4.5ml of e-liquid, which is a good amount in my opinion as many other tanks tend to be 2ml or 3ml. The overall base diameter is about 25mm, so even if you wanted to use this tank on other mods you have, you can without much worries. The top fill design is something we’ve seen before with other tanks where you click a small button and it flips open the top fill port. This makes filling quite easy, especially since the fill ports are massive. One thing to note is that this tank is compatible with Illusion Mini Coils, so if you have this tank or coils for this tank, you can use them with the Shield. Overall, my first impressions of the Geekvape Aegis Kit was 100% positive with no cons to be mentioned whatsoever. Like mentioned earlier, it’s definitely a huge pro that Geekvape includes all of the extras as that certainly adds some more value to your purchase. Using this vape starter kit for over the past couple of weeks has been nothing but a great experience. This was to be expected since I’ve been using the Geekvape Aegis 100w TC Box Mod for some time now, and it still is one of my favorite, if not my favorite 26650 box mod on the market today. 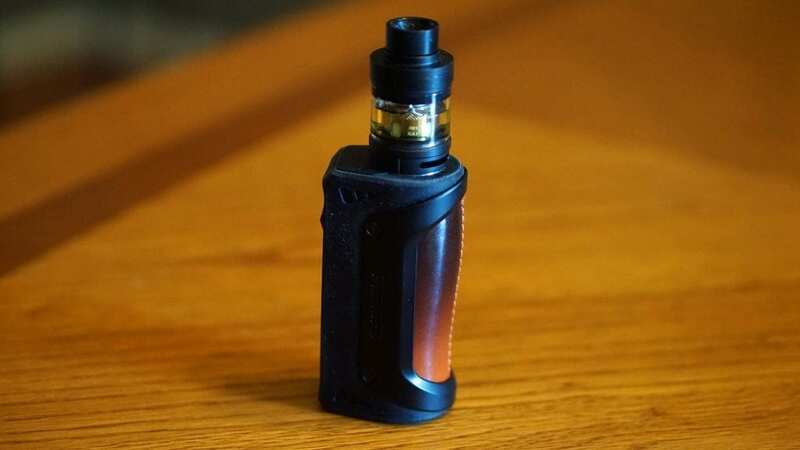 With that being said, I mainly used this specific Aegis with the IJoy 26650 battery as this provides excellent battery life and solid performance with no noticeable battery sag. Now, since this kit does include an adapter for you to use 18650 batteries, I did use it a few times with a 3000 mAh Sony VTC6, but the battery life wasn’t as good as a 26650 battery of course. With the size of this device, it’s worth using a larger battery in my opinion, especially if you don’t mind the added weight of it. I did use a 21700 and 20700 battery as well, and I much preferred a 20700 battery in comparison to an 18650 and 21700 battery. With a 20700 battery installed, there is zero battery sag until the battery life is quite low. This of course will be determined by which battery you use in this device. One thing to mention though when using a 21700 or 20700 battery, the battery cap isn’t as easy to get off in comparison to the standard battery cap used for an 18650 or 26650 battery which has a “hook” that extends out to easily unscrew the cap. With the 20700/21700 cap, you would have to use something like the back end of your vape tweezer, as it’s not ideal to be using your finger. This makes accessing your batteries pretty inconvenient, especially when comparing it to the other battery cap included. It’s not terrible by any means, but if you’re on the go, it’s definitely not something I would recommend. The Geekvape Aegis is larger and heavier than most other single battery devices, but it can still easily fit in my pocket or bag. If you’re looking for something stealthy, then this wouldn’t be an ideal choice, but if you don’t mind the size, then I would definitely recommend taking it out with you since it’s very durable. Thankfully, it is pocket friendly, even with the Shield Sub Ohm Tank attached, making it easy to take out with you during the day. Even though this device is larger and heavier, it still remains ergonomic. The Halloween Special Edition features a burnt orange leather back, which is surely eye appealing and feels great in the hands. I’m not going to cover too much about how to operate this device since we’ve covered this before, but it’s a very simple menu system. 5 clicks will turn the device on or off, and 3 clicks when the device is on will allow you to scroll through the different modes such as temperature control (Ni200, Ti, SS), Bypass mode (essential turns it into a unregulated device), a TCR mode, and a wattage curve mode. I do want to mention that on the back of the packaging it does state that this device is designed to avoid damage by accident, so if you do have an Aegis or planning to purchase one, I wouldn’t recommend intentionally trying to damage it. For testing purposes, I did submerge this device in water and dropped it quite a few times, and it works perfectly fine with zero issues. All in all, using the Geekvape Aegis 100w Kit has been great! 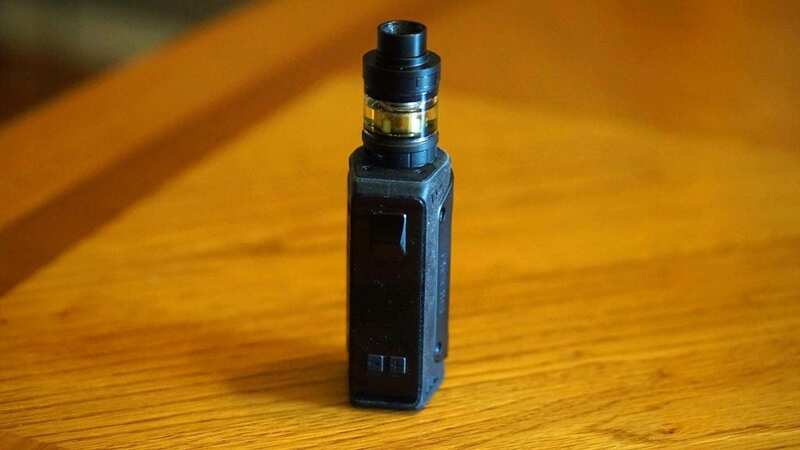 It is a fairly large device and sub ohm tank, but you can still carry it in your pocket with no problems. The only negative point while using it is that the 21700/20700 battery cap isn’t the quickest to unscrew or screw into place, especially when compared to the original battery cap. As mentioned previously, the Geekvape Aegis 100w Box Mod does have a maximum wattage output of 100w. Now I don’t have the equipment to really test if it can actually fire this high of a wattage, but I can certainly say it feels close enough to it, especially when using a 20700 battery. Even with a 26650 battery (the IJoy variant), it does feel quite close to the 100w range, but not as close as the 20700 battery. I do want to mention that the Aegis does fire instantaneously with no fire delay noticeable, which is always a good thing! 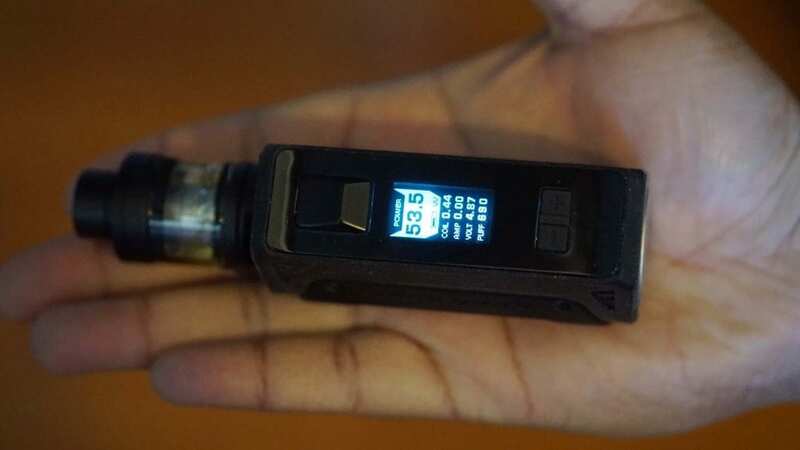 If you’re a vaper who prefers to vape at higher wattages, then this device may not be for you as you’ll simply chew through battery life with a single battery. A dual 18650 or triple 18650 vape mod would probably suit your needs much better than the Aegis. However, if you’re a vaper who enjoys vaping between 50w and 80w, this is an excellent choice in my opinion. The temperature control function works great, and I didn’t find myself really needing to adjust the TCR value. A good thing is that when in the standard SS TC mode, the TCR value is shown, and you can adjust it right there and then once you access the menu by clicking the fire button 3 times. This is a great feature in my opinion, and wish more vape mods did this. Now moving on to the Shield Sub Ohm Tank, two replacement coil heads are included which are the 0.15 ohm (spare) and the 0.4 ohm which is pre-installed. To my surprise, the flavor from this tank is actually very good, and better than some of the other mid-wattage sub ohm tanks on the market. The airflow is nice and smooth, but it is quite loud. Even when closing the airflow off to about half way to my preference, the airflow is pretty loud. With the airflow wide open, it is quite airy, which is good for you vapers who like a full on lung hit. The 0.4 ohm coil, I would prefer to vape it between 50w and 60w. This would give me a semi-warm vape, and I could easily chain vape without getting a dry hit. The 0.15 ohm coil, I would prefer to vape it around the same wattage range, but a little higher as well, to about 70w. At 70w, the vape is on the warmer side, which is what I personally enjoy. The break in time for both of these coils is about half a tank, which isn’t too bad in my opinion. A pro to be mentioned is that these coil heads don’t really guzzle through e-liquid like some other tanks, especially those higher wattage sub ohm tanks. I would say a full 4.5ml tank would last me a few hours before needing to refill. Refilling can be done easily by clicking the button at the top which is located around the top fill portion of the tank. The fill ports are large enough for pretty much any e-liquid bottle used today, which is great. All in all, the performance of the Geekvape Aegis Kit was stellar! I had no complaints when it came to its actually performance, and was pretty surprised by the performance of the included Shield Sub Ohm Tank. In conclusion, the Geekvape Aegis Kit is an excellent vape starter kit from Geekvape that offers not only excellent durability, but outstanding performance. A huge pro is the fact that they include so many extras with this kit such as the additional battery cap, the 18650 adapter, and more. It’s great that they added these extras in this kit, especially the battery adapter and cap, as they could’ve easily made this a separate purchase. Now even though there were so many pros, there were some cons to be mentioned, and half of them are from the original review, which is the larger and heavier size and screwed battery caps. Both of these cons are subjective, and many vapers don’t really mind these two, especially when you consider the way it’s designed and aimed at delivering. The loud airflow is not that big of a deal to me personally, but I know some vapers who simply can’t stand a loud tank. The 20700/21700 battery cap is mostly an issue when you’re out, and I personally used this mod exclusively with a 26650 battery for the extended battery life. Overall, if you’re looking for a well built kit that can easily withstand a beating, then look no further than the Geekvape Aegis Kit! The Aegis Mod still is one of my favorite 26650 devices to use, and I don’t see that changing anytime soon, especially when matched with the Shield Sub Ohm Tank. We hope you find this review helpful in finding the right vape starter kit to fit all of your vaping needs! Feel free to leave any questions or comments down below! Thanks for reading!